A gnome, one of the playable races in SK. As a player, you will experience the game from the first-person perspective of the character you create. She will be unique to every other in the realm, having a personality that can change over the course of her life. All player characters (PCs) in Shattered Kingdoms are unique citizens, elevated in the eyes of the Pyrathian world. There are shopkeeps, blacksmiths, and peasants all around the kingdoms, but PCs are adventurers called to higher purposes. Your character is a celebrity of interest to other very important adventurers in the realm! You have great liberty to choose who your character is and where he comes from in Shattered Kingdoms. Many players find that their characters reflect themselves, and this is fine. Playing up one aspect of your own personality — your ambition, for instance — may make it easier for you to role play than if you were to create a character you could not relate to. 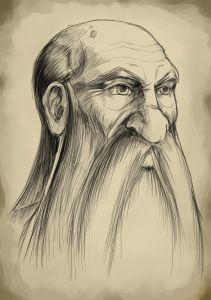 Each decision you make in the character creation process will help to build a cohesive person that lives in Pyrathia. He will have strengths and weaknesses. He’ll make friends and face enemies. He will triumph and he will fail. The Rules Manager may use his discretion to change names if they do not meet these criteria. For those stuck on deciding a name, there are many fantasy name generators on the Internet. We recommend this one. A description is an important aspect of a character and should be completed by the time he or she reaches Novice status. Descriptions should be at least three complete sentences long and should only describe what another character could easily observe. You can include physical attributes from eye color and scarring to smells and the sound of his or her voice. Avoid adding details about personality or making assumptions for the reader. You can find an excellent article about writing character descriptions here, and a tutorial on how to create a description within the Shattered Kingdoms editor here. Your character’s adjective is a one-word description of him or her. It is often easier to create a description first and then think about a word to encompass what you’ve written. For instance, if you describe that your character has extensive scarring on his face and neck, his adjective might be scarred. Or maybe her blue eyes are the first thing people notice — she might be blue-eyed. Note that hyphenated adjectives are acceptable. To assign an adjective to your character, use the adjective command in the game. Creating a back story for your character assists players in role playing a full character with memories, experiences, and an outlook that will strongly influence their growth and interactions with other characters in the game. A background can be as simple as “she was born to a loving family,” or as traumatic as “he was lost in the snows of the north and adopted by a mountain tribe.” Note that this step is only for your own information – we do not require any written submission or registration for you to play the game. Exploring the races, classes, kingdoms, and even alignments may give you inspiration for your character’s background.